Kenmare News | Giving back to the local community! 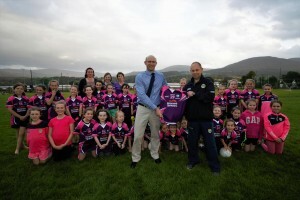 Kenmare Opticians are delighted to support the U10 Inbhear Scéine girls GAA team. Pictured are Geoffroy Meynet, Director Optometrist, presenting jersey to coach John Daly watched by Antoinette O’Shea, Optical Assistant, Ethel Killington-Meynet, and Norma O’Connor, Optometrist. A great team looking as good as they play!